Anyways, I have a card for Stamper's Dream to share with you today. It is also my card for CPS Sketch #233, where we are being sponsored by Clearsnap this week. They sent us some fun Smooch Spritz & Smooch pearlized accent inks to play with, and I used them on my flower accent! My card also fits the following challenges: 2011 Christmas Card Challenge Week #39 (to use a photo), and Christmas Cards All Year 'Round August challenge (ribbon, inking, stamping, textured paper). Here is what I created!! Instructions: Make card from green metallic cardstock. Cut text paper slightly smaller, distress ink the edges and adhere. Cut a doily in half, distress ink, and adhere. Cut and adhere the vintage image to the upper left corner. Spray a white paper flower with holly berries Smooch Spritz, and then cover the leaves in the pearlized accent ink. Adhere the flower to the bottom right side of the vintage image. Tie a bow from gold ribbon, add a button to the middle using twine, and tuck into the side of the flower. Diecut a tag from vintage cream cardstock, stamp the sentiment to it, and adhere to the middle of the tag. 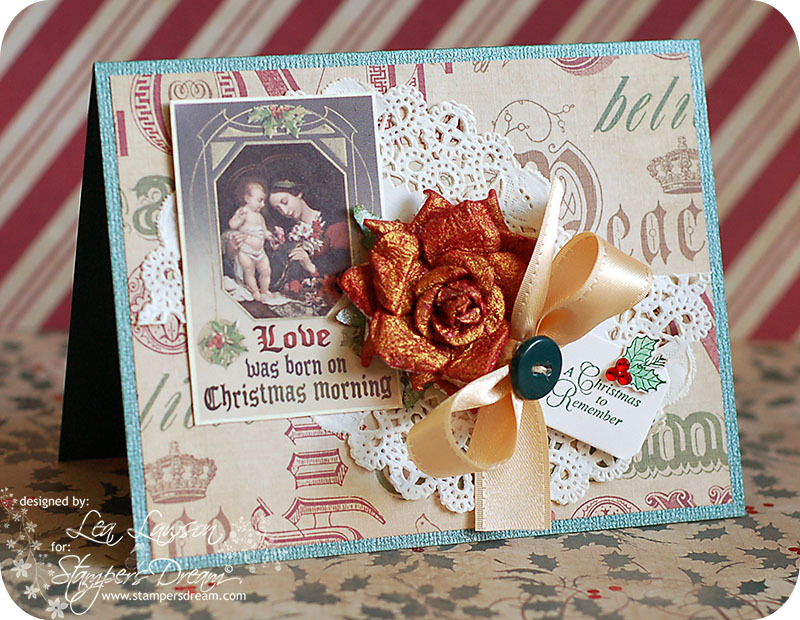 Stamp the holly leaves to vintage cream cardstock, cut out and color in the leaves with colored pencil. Add three jewels in place of the berries, and adhere to the sentiment tag to finish. Lea, this is lovely ...so loving Christmas! This is gorgeous! I love everything about it. So glad you joined us for this weeks CCC! So pretty! The flower is the perfect touch! Thanks for joining us at CCC!